Karate Legends Series. O Sensei Taiji Kase, Karate Master and Pioneer in Europe. There are only a handful of men alive who can be credited with taking the Okinawan art form of Karate Master Gichin Funakoshi and contributing to the development of what we know today as traditional Japanese Karate With the passing of Taiji Kase Sensei in November of 2004, the world lost another “first generation” JKA Karate Master and founder of a new Ryu-Ha. Taiji Kase Sensei takes his place among Karate legends because not only was he a master of his art, he was, to say the least - different. 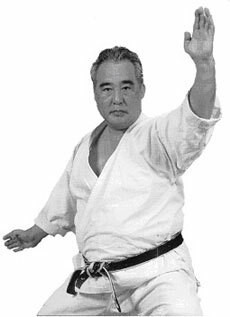 If there is such a thing as a model Shotokan exponent and teacher of Shotokan Karate techniques, he did not fit it, either in appearance, style or philosophy. Taiji Kase was born in Japan on January 9th, 1929. His father was a Judo Instructor, so it was no wonder that he started Judo around the age of 6. In his Judo days he came to know such masters as Kyuzo Mifune and Masahiko Kimura and he trained briefly with Mas Oyama the founder of Kyokushin Karate. “...the people who owned a Katana, firearm or practiced Karate had to inform the police about it, because they considered it a weapon, which was not the case with the other martial arts. At this time, I was practicing both Judo and Karate. 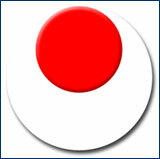 When I was about to test for 3rd Dan in Judo, I had to stop practicing it, since Karate took up most of my time”. Gichin Funakoshi Sensei’s 3rd son Yoshitaka had a great influence on Taiji Kase. Yoshitaka or Gigo as he was known, was a Karate master who enhanced his fathers teachings with his own interpretation of Shotokan Karate techniques. 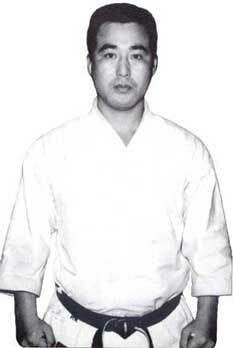 Genshin Hironishi was another teacher at the ShotoKan who had a great affect on Kase who always remained true to the teachings of each Karate master. 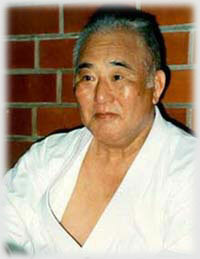 In his early days, Kase Sensei also practiced Aikido with the founder Morihei Ueshiba. At 16, he enlisted in the Imperial Navy but the war ended that year, so he continued his training and education. In 1946, he graded Shodan in Karate and in 1949, as captain of Senshu University, he graded Sandan - third degree black-belt. At that grading, Takagi the captain of Chuo University and Shimamura the captain of Takushoku (and Sempai to master Nishiyama) obtained the same rank of 3rd Dan. In 1951, Taiji Kase graduated with a degree in Economic Science, but he wanted to become a professional Instructor, so he joined the newly formed Japan Karate Association, the institution founded by Gichin Funakoshi Sensei’s senior group headed by Masatoshi Nakayama – see our Karate Legends series - who remained JKA Chief Instructor until his death in 1987. The JKA was the worlds first ever properly constituted Japanese Karate body with a stated purpose. It was appointed by the government as part of the education curriculum and had a policy to expand Japanese Karate and Shotokan Karate techniques worldwide. At the JKA, Taiji Kase Sensei helped in the development of many younger Instructors such as Enoeda – read about Enoeda - Ochi, Shirai and others. At that time he eagerly took on the responsibility of dealing with "challenges" against the JKA, which evidently took place often. In 1964, the year of the Tokyo Olympic Games, Taiji Kase Sensei left Japan as part of the JKA’s plan to globalise Japanese Karate. He spent time in South Africa then toured the US and Germany before moving onto Holland and Belgium. 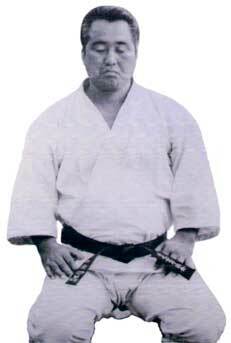 In 1967 he helped Master Shirai establish himself in Italy, then moved to France where he settled permanently. Stories abound about the early days in Paris where Kase Sensei had to prove himself in several direct physical challenges. Henry Plee, known as the pioneer of French Karate, spoke about this when he said, once you saw Taiji Kase in action, you admired and respected him, “...he goes directly to the essential. Shotokan Karate Techniques for him are only the means - what is important is the result”. Taiji Kase Sensei’s brand of Karate was naturally suited to his body type. He had a very stocky but strong physique with short legs and arms, but incredibly his waza defied his appearance. He would routinely hold classes where nothing but keri waza - Karate kicks - were practiced. Not just standard Karate kicks, but every variation of hook-kick, reverse roundhouse kick, heel kick, inside front roundhouse kick imaginable. For sure, Kase Sensei had at some point become determined to be a kicking specialist despite not having the long skeletal structure thought to be necessary for good Karate kicks. Whilst his leg techniques amazed everybody, his open hand techniques, his tai-sabaki, his fast and precise movement and his unique Kamae were also special. He taught Karate blocks with a full range movement at maximum power then reduced the movement, firstly to half range and then to just a few inches. During this process, he would still retain the power of the block as if it was a full range movement - very difficult to do. He said that in combat there would be no time to do full Shotokan Karate techniques especially Karate blocks, but short range blocks done at full power would hurt the opponent's attacking limb. He described this as "speed plus power Karate". In kumite, he would say that “you should be able to go from zero to one hundred percent in an instant”. 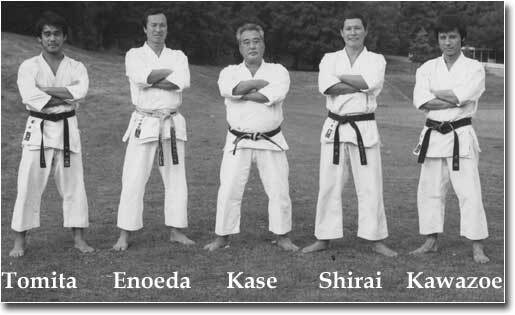 By the early 70’s Kase along with Enoeda, Shirai, Ochi and some others had had firmly established JKA in Western Europe. The group regularly held seminars together such as the famous Crystal Palace Karate Summer Camp courses in London where Karateka from all over the world regularly gathered. The shot above was taken by Bernard Rose in 1978 at that course. In the 80’s Kase Sensei published two books covering most Shotokan Katas including Eighteen Superior Katas and Five Heian, detailing the applications and main technical steps. Taiji Kase Sensei’s Karate had great appeal. He naturally attracted a following of like-minded people for whom he represented more than a Karate Master. He remained with the JKA until the late 1980's, when he left to set up his own organisation. As Henry Plee said, Taiji Kase wanted to do just Karate, and this allowed him to do that in the way he wanted. 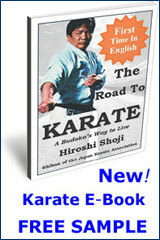 In 1989, he co-founded the World Shotokan Karate Academy. The WKSA is dedicated to the education of black belts and professionals of Shotokan Karate. Taiji Kase was living proof of just how much could be achieved with disciplined and regular training in Shotokan karate techniques. He was always willing to share his knowledge and experience with those who listened. Kase Sensei studied the old books of Budo as well as appreciating poetry and philosophy. He was an authority on Martial Arts history, in particular Shotokan Karate History which is no wonder considering his acquaintance with many a Karate master. In a lifetime which spanned the early years of Japanese Karate through to its consolidation and spread across the globe, he has contributed more than most. ...and understand the idea mentally as well as technically. You must do everything possible so that the attacker understands that it is better for him not to attack, to feel it and accept this. This is the true meaning of the saying "Karate Ni Sente Ashi" - that the adversary does not begin attacking and so there is no fight”. “O Sensei” Taiji Kase passed away on 24th November 2004 in Paris France joining the many Karate Legends who went before him. He was cremated in a private ceremony following a meditation and homage to his memory by family, friends and students. He is survived by his wife Cheiko and two daughters. There are not many from Taiji Kase Sensei’s generation left who have dedicated their lives to the practice and spread of Japanese Karate.